Egyptian President Abdul Fatah Sisi is pushing for legislation to change the way divorce is handled in the most populous Arab nation. 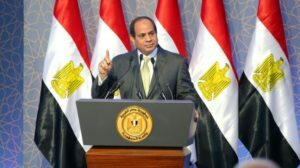 In a televised address marking Police Day on Jan. 24, Sisi suggested the adoption of ground-breaking legislation to prohibit divorces verbally declared by Muslim men to their spouses. Sisi made the comments after learning from the head of the state Statistics Bureau that about 40 percent of Egypt’s 900,000 annual marriages end in divorce after five years. The Egyptian president suggested to the Grand Imam of Al-Azhar, the Sunni Muslim world’s supreme seat of religious learning in Cairo, that the legislation should be adopted so a divorce would be legal only if it is done in the presence of a “maazoun,” a cleric authorized by the government to officiate marriage and divorce. Some couples already do that, but many Muslim husbands also divorce verbally – often in the heat of an argument – before later documenting the divorce. “Why cannot we, as a state concerned with the safeguarding of society … issue a law that only legalizes divorce when done in the presence of a Maazoun so we can give the couple a chance to reconsider?” Sisi said. Sisi has in the past taken strong stands on social issues, including speaking out against sexual harassment, one of Egypt’s chronic social ailments. Also on his watch, Egyt’s 596-seat parliament last year toughened penalties for female genital mutilation, adopting amendments that punish perpetrators with up to 15 years in prison if a child dies and up to seven years for performing the procedure.